O'leary, Kim Patrick. "Expo 86". The Canadian Encyclopedia, 31 October 2018, Historica Canada. https://www.thecanadianencyclopedia.ca/en/article/expo-86. Accessed 18 April 2019. In 1978, Sam Bawlf, provincial minister for recreation and conservation, had proposed an international exposition to celebrate Vancouver's centenary based on a concept study by architect Randle Iredale. Built as Expo Centre for Expo 86 at Vancouver, BC, the building has been renovated and reorganized as a science centre. Expo 86, Vancouver, BC, was opened 2 May 1986 by the Prince and Princess of Wales and closed 13 October 1986 after 20 111 578 visits. Two sites covered 70 ha: the main site of 67 ha ran 4.5 km along the north and east shores of False Creek, and the Canada Pavilion, located off the main site, covered 3 ha. In 1978, Sam Bawlf, provincial minister for recreation and conservation, had proposed an international exposition to celebrate Vancouver's centenary based on a concept study by architect Randle Iredale. A formal application for a fair called Transpo 86 was submitted June 1979 to the Bureau International des Expositions in Paris. Various sites and plans were proposed. The BIE approved the fair in November 1980. Patrick Reid, Ambassador and Commissioner General, changed the name to Expo 86 in October 1981, eliminating any connotations of a trade fair. 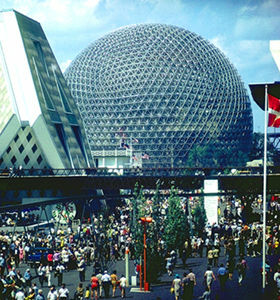 Unlike Expo 67 this was a special category exposition, the largest ever held, with a single theme of transportation and communications. The theme statement of "World in Motion - World in Touch" was symbolized by a logo of 3 concentric circles using the figures 8 and 6 intersecting to represent transportation by land, sea and air. After difficulties with funding through 1980-81, plans were finalized. 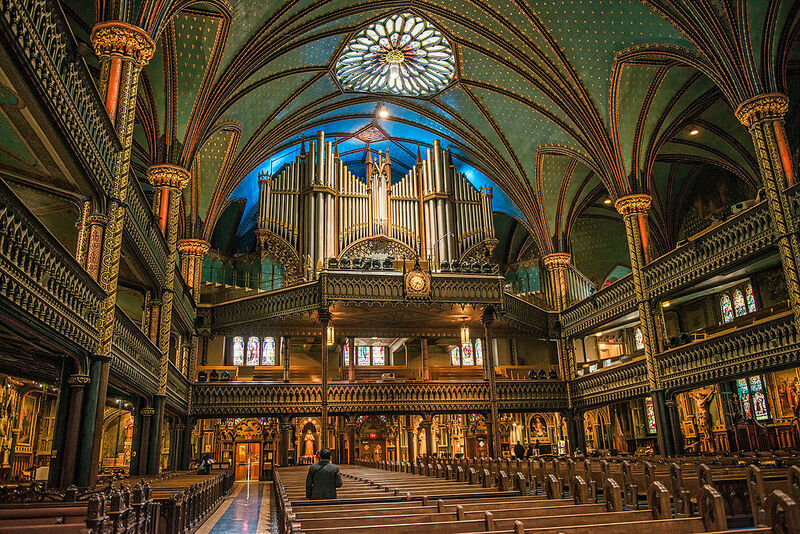 The project was sponsored by the federal and provincial governments. Expo 86 Corp was established as a nonprofit agency to plan and operate the fair and was headed by Jim Pattison, chairman of the board and later president. Creative director was Ron Woodall, chief architect was Bruno Freschi and Bob Smith was in charge of production and design. Construction of the first pavilion began in October 1983. Labour disputes for 5 months in 1984 disrupted work but the pavilions were completed on schedule and $8 million under budget. Expo Centre opened 2 May 1985 as a preview of the fair. The site was divided into 6 coloured zones, each containing pavilions, theatres, rides and restaurants. The centre of the site was dominated by the 4.5 ha BC Place, which remains after Expo. It included a covered stadium, Expo Theatre and the Plaza of Nations where national and special day ceremonies were held. There were 65 pavilions: 41 were international; 7 provinces, 2 territories, 3 states and 9 corporations had pavilions; 2 were theme pavilions and one was special (Ramses II containing treasures from the life of the pharaoh). Two theme pavilions remained after the fair: the Roundhouse exhibiting "The Golden Age of Ingenuity" in transportation is a renovated 100-year-old railway roundhouse, and the Expo Centre "Futures Pavilion" is a 17-storey geodesic dome with a 500-seat OMNIMAX theatre, a Futures Theatre with push-button voting and Design 2000, an exhibit of futuristic vehicles. The Expo Centre reopened as Science World by 1990. One of the most popular pavilions was the Northwest Territories pavilion, designed by architect Bing Thom. It was constructed of pale blue plaster with reflective blue glass to resemble icebergs and glaciers. The NWT exhibits, combining film, photos with text, displays and models, were visually stunning and thought provoking, giving the visitor insights into the dramatic effects of transportation and communications on the life and culture of northern Canadians. The most frequent features of many pavilions were films. Among the more popular were Carrying Things, a 3-D IMAX film; Canadian Pacific's Rainbow War; Telecom Canada's Portraits of Canada - Images du Canada in circlevision; A Freedom to Move; Zargon, a 70mm Showscan film; and Northwest Passage, a 69-slide projector show in which viewers were transported along a moving walkway. Perhaps the most popular film was General Motors' Spirit Lodge, produced by Bob Rogers, a live presentation combined with holographic effects presented in a darkened Big House, prepared with the assistance of the Nimpkish Band of the Kwagulth (Kwakiutl) people of Alert Bay, BC. There were 9 plazas on the site, 3 related to transportation. The Land Plaza was filled with land vehicles from all nations centered around the sculpture "Transcending the Traffic," a 26 m tall "traffic jam" by sculptor Bill Lishman. The Air Plaza's "Flight Dream" was a celebration of forms of air and space travel. Examples of water craft in the Marine Plaza were located near the 33 m high brightly painted, steel sculpture "Dream Ship," which resembled the superstructure of a large sailing vessel. This plaza hosted a gathering of hundreds of water craft from around the world, including Japan's tall ship, the Nippon Maru. Six theatres operated by Expo provided free entertainment daily. The Royal Bank/Expo 86 World Festival was held at venues throughout Vancouver including Expo Theatre. Among performers were world-renowned ballet and opera companies, dancers, singers, comedians, musicians and rock groups. All on-site transportation was free. A 5.4 km monorail gave a 20-minute ride through the site to 10.5 million passengers. Two gondola skyrides carried 9.75 million people. 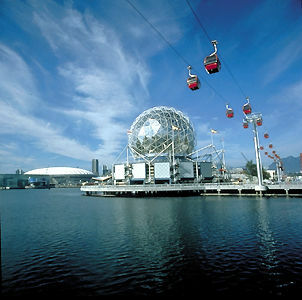 Free, direct transportation to the Canada Pavilion was by Skytrain, Vancouver's newly opened light-rail transit system. Access to Skytrain from the main site was through the Canada Portal marked by the world's tallest freestanding 86 m flagpole, a Canadian flag 12 m x 24 m and a hockey stick 61 m high. The Canada Pavilion, with 10 800 m2 of exhibit and performance space, extended 3.5 city blocks into Burrard Inlet and cost $145 million. This dramatic white building with mountains, water and city as backdrop was constructed to resemble a ship with 5 large "sails" of suspended fabric. The pavilion now serves as a convention centre and cruise ship terminal. An old Haida war canoe from the Canadian Museum of Civilization in Ottawa was the centrepiece of the exhibit hall and was juxtaposed with Hystar, a "flying saucer" being developed as a carrier for heavy cargo in remote areas, which was flown around the hall once every hour. Among the most entertaining spectacles were the sculptures: Ron Baird's "Spirit Catcher," a huge iron bird; "Rowingbridge" by Geoffrey Smedley; Miho Saawada's "Locomotive People #4"; and John Gilbert's bright, colourful, popular "UFO H2O", a children's water playground that resembled a Martian spaceship. The largest sculpture was "Highway 86" designed by S.I.T.E. Projects (NY), a 217 m undulating steel and concrete 4-lane freeway for pedestrians. Many forms of air, land and water vehicles, painted grey, were cemented to the freeway. Expenditures for the fair were $802 million and revenues were $491 million. The federal government contributed $75 million to build Canada Pavilion, $60 million to build Skytrain and $25 million toward the deficit. More than 36 corporate sponsors committed $173 million. Participants spent $698 million for total expenditures at Expo of $1.5 billion. The final deficit was $311 million. However, the Canadian economy received an extra $3.7 billion as a result of Expo 86. The fair proved so popular that restaurants and clubs on-site remained open after pavilions closed each evening. Expo 86 will be remembered for the warm, friendly spirit that existed among the exhibitors, staff, 8000 volunteers and visitors. "Expo 86: A Troubled Legacy"Read this article from the Westender that examines the legacy of Expo 86 from various perspectives. "From Sleepy Town to World-Class City"Read this CBC News article about how Expo 86 marked Vancouver's coming-of-age.